This term our Foundation Diploma in Art and Design students have been taking part in a series of projects responding to the National Gallery’s collection. Students attended a series of lectures, visited the gallery and also the studio of artist in residence, George Shaw. 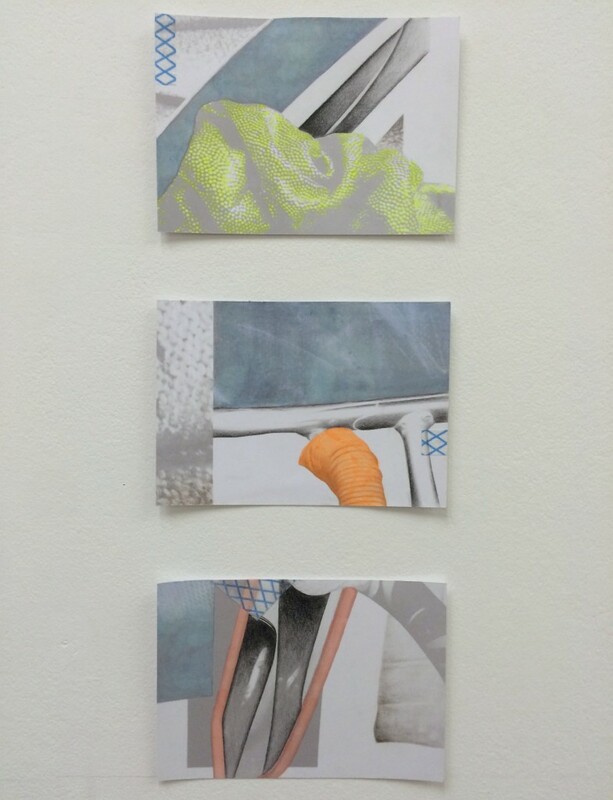 In response to these activities they then produced small scale works which have been exhibited in weekly group shows at Camberwell Space Projects. We asked students from Painting and Print and Time Based Media specialisms to give us an overview of the project and discuss their work. An exhibition of Sculpture and Drawing student work will be opening with a Private View between 16.00 – 18.00 (open to all), this Friday 22 January. ‘I found the project to be an interesting departure from the previous painting briefs: using other artist’s work as a starting point for my own is something I had never attempted directly, as I often tend to work from life or 3D models. The project presented an alternate approach to making a painting that I have begun to consider as part of my own practice. The exhibition of the project, where we had to make a series of three mini collages, was our first opportunity to present work outside of the studio. It was exciting to create something that would be seen by a wider audience and gave me an opportunity to make some more refined pieces as I often focus on developmental studies. *Please note this video footage contains flashing images. ‘We began by attending an interesting talk exploring how contemporary artists are always looking back to traditional works. Visiting the National Gallery collection afterwards gave us a different view and insight into the pieces in the collection. For the project I tried to develop work into my own style whilst maintaining the ideas of traditional artists. 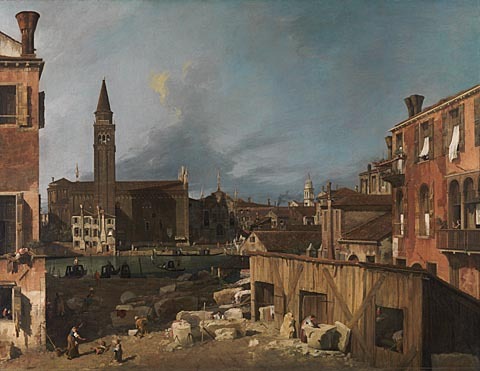 I was particularly interested in Canaletto’s ‘The Stonemason’s Yard’, with its focus on hard-worn, dilapidated windows and shutters. 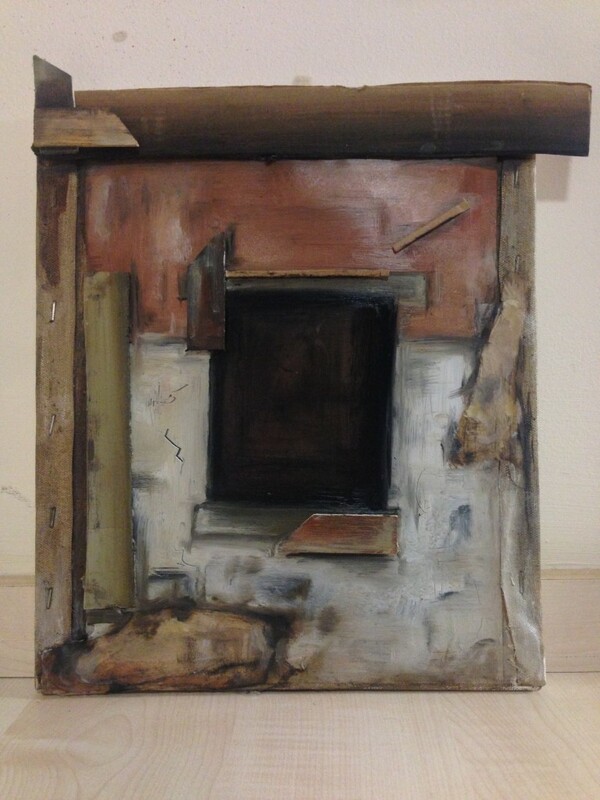 I tried to reproduce this dereliction through using different materials and processes. 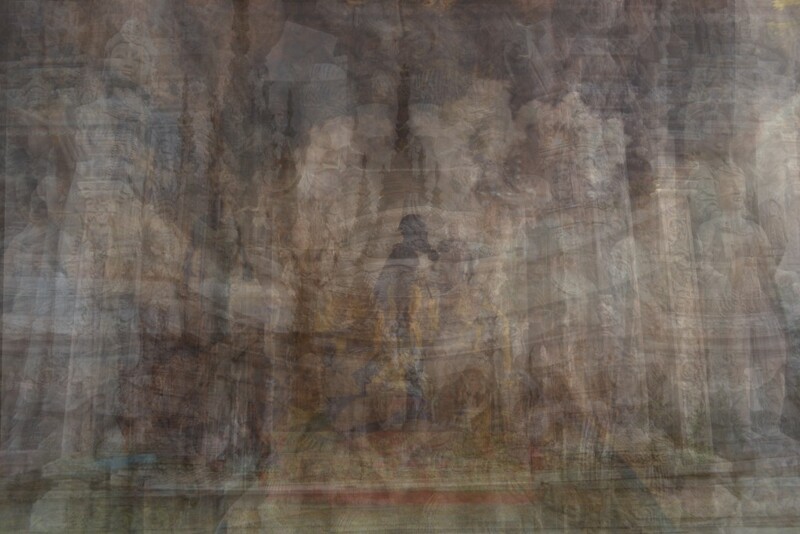 Video work created in response to the National Gallery collection. ‘I was initially interested in the religion section at the National Gallery as well as the painting Doña Isabel de Porcel by Goya where another painting was discovered underneath. This got me thinking about facades, in particular the facade that can be seen in religion. Religion is something a lot of people find peace in, but it has led to a lot of discomfort and hurt throughout the world. I found the topic of my project very interesting and was different to anything I had looked into before. It has definitely inspired me to continue looking into the idea of facades, maybe continuing with linking it to religion or in other terms. ‘I was very excited when I learnt that we would be going to visiting the studio of George Shaw as I had written my essay on him for our Part 1 assessment. I felt really lucky to see his paintings in real life – not hung in a gallery but in process. We were given a list of paintings to find and draw influence from, however I was especially interested in a collection of 17th century urban landscapes that were not on the list. I paid attention to the shapes used to depict churches and ornate architecture, then did my own studies of a local church and other buildings in my area. 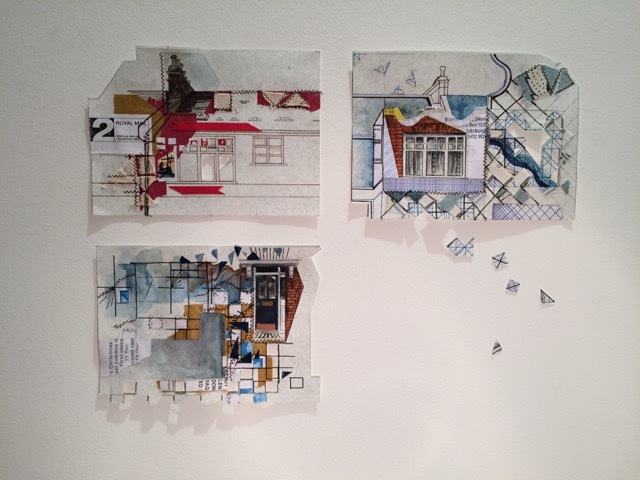 For the exhibition I created three postcard-sized collages/drawings of my house on textured paper.